Mormon Wookiee: #25: My five favorite Mormon bloggers (by category). #25: My five favorite Mormon bloggers (by category). Since starting my blog a couple of months ago, I have spent a fair amount of time looking at other Mormon blogs. I like to see what topics these bloggers write about, I like to see the comments that their visitors post, and of course, I like to see if anybody else loves Star Wars as much as I do (so far, I appear to be the biggest Mormon nerd out there). In my opinion, Mormon blogs can be broken down into five categories: (1) Deep Researchers, (2) Defenders of the Faith, (3) Different Perspectives, (4) Dividers and Conquerors, and (5) Daily Life (I like alliteration). Here is my list of my favorite blog in each category. I guess you could say that LDS FAIR (Foundation for Apologetic Information & Research) is more of a wiki (sounds like wookiee! ), rather than a blog, but either way, it's amazing. I could spend all day on LDS FAIR. If you are looking for information about any topic related to the Church of Jesus Christ of Latter-Day Saints, you will probably be able to find it on FAIR. The site started way back in 1998 (I was almost old enough to drive in 1998) by a group of Mormons who posted online in order to defend the Church from anti-Mormon comments and misleading statements. The group decided to take their responsibility seriously and incorporated as a non-profit organization. Many of FAIR's authors have publicized their work. Mormanity is the one-man blog of Jeff Lindsay, a member of the Church currently living in China. Jeff is my Mormon blogging hero. He is truly "not ashamed of the gospel of Christ" (Romans 1:16). Jeff tackles anti-Mormon issues, responds to current political events, shares his testimony, and also provides insight into his life as an American business man in China. "I think that's the miracle that I should always be praying for - not to be freed from trials or tribulations, but the miracle of being able to live and keep the commandments in any situation. Being willing to date, and learning to enjoy it, even though I'm not attracted to women. Coping with attraction to guys and finding ways to ensure the positive side of interactions with them. And being willing to live life and keep moving forward no matter what happens - even if I spend the rest of life alone - and learning to be happy in those circumstances" ("The Tenth Leper", Gay Mormon Guy, 11/20/2011). I admire his courage to live the gospel with faith and hope for the future no matter what. I think his insight provides a remarkable example for each of us to never give up, to never lose faith, and to never stop trying to live the gospel, no matter what our particular challenges may be. There is something to say about strength in numbers. Modern Mormon Men (MMM) was launched earlier this year by two guys, Jon and Scott, out of Seattle as a response to all the "Mormon Mommy Blogs". In the short space of only six months, MMM has grown from two bloggers to 20+. The articles cover a broad range of topics (from scriptural commentary to current events and everything in between). Plus, MMMs logo is rad. Notice the bottle in his hand. Great touch. I have been following Stephanie Nielson's (NieNie) for the last year-and-a-half, ever since I saw the "Mormon Message" about her life on youtube (http://www.youtube.com/watch?v=KHDvxPjsm8E). NieNie's blog is among the variety known as "Mormon Mommy blogs". There are hundreds of Mormon Mommy blogs out there, but I think NieNie's shines above the pack due to the remarkable trials she has had to overcome. NieNie was in a tragic plane crash a few years ago. 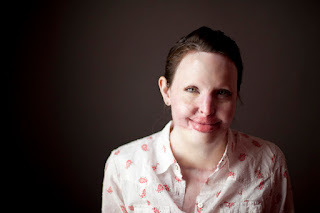 80% of her body was burned, and she was in a coma for a fair amount of time after the accident. Before the accident, NieNie was a beautiful wife and mother of four children. Since the accident, her physical beauty may not be the same, but she has written many times about how beauty is NOT only skin deep. I admire her faith, humility, humor in the face of trials, and optimism for the future. In fact, she is now pregnant with her fifth child, which is a wonderful miracle for her and her family. NieNie is a real inspiration to me.